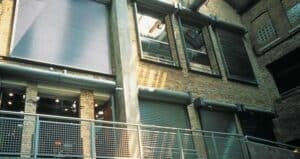 We offer a wide array of rolling steel doors to meet the most demanding fire safety standards, unusual opening sizes and discerning aesthetic requirements. Designed to close automatically in the event of a fire or alarmed event, our fire-rated doors are available for service door and counter applications in commercial, industrial, institutional and retail projects. Customized fire doors are also available for conveyor openings. All doors comply with NFPA-80, and are listed for both masonry and non-masonry applications -- including installation to wood or steel jambs within drywall. The Fire Sentinel® time-delay release device provides an added measure of safety to control the doors' closure. Our FireKing™Fire Doors feature an innovative floor reset hoist system, designed to eliminate the need to release a fire door's spring tension on fire drop mode and allows one person to reset the door from the floor. In need of a fire-rated door for your facility, but not sure exactly where to start? Save time, and let us do the work for you by giving us a call at (651) 683-0307. With a few simple questions, one of our experienced Sales specialists will be able to help you select the door that best fits your environment. On the other hand, if you know exactly what you are looking for in a sectional door, you can review exact door specifications at Overhead Door's website.